That's because certain design styles for those rooms change so frequently. If your kitchen and/or bathroom design is up to date then your home will be at its highest resale value. The image to the right is part of a kitchen remodel we recently completed. The previous layout had very little cabinet space. 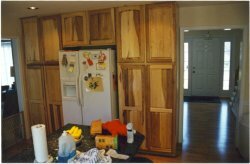 Using these custom made Hickory cabinets to create a pantry area around the refridgerator, we were able to triple the storage space without sacrificing much valuable floor space. In addition to the new cabinets, we also installed new appliances, granite countertops, stainless steel sink, and a tile backsplash. The custom cabinets backsplash and countertops give the room a more traditional style that have proven to hold their value much longer than other materials and they last longer against wear and tear too. Call today for a free estimate on upgrading your kitchen or bathroom. Don't forget to download your $100 coupon too. Just click on link above to view more pictures @ Facebook! Serving Delaware, Maryland, Pennsylvania & New Jersey since 1990.